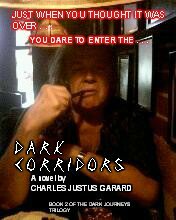 Review of Charles Justus Garard’s “The Dark Journeys Trilogy” by Andrea Baskin, author of DARKNESS AND REVENGE: THE PUPPETMASTER’S GAME. Okay. I admit it up front. I was one of those suckers who, according to P.T. Barnum, is born every minute. I believed the count of four stars for this “movie.” I ordered it because I was impressed by the book THE MOTHMAN PROPHECIES by John Keel and by the expertly directed and photographed film THE MOTHMAN PROPHECIES starring Richard Gere and Alan Bates, two class-act actors. In other words, I am a Mothman fan. So I am a sucker. I admit it. When I was a kid and a young man, I made my own 8mm horror movies. Amateur stuff, of course. But at least they had a plot. At least I did not palm them off on buyers of DVD movies. They were in color, but silent. This “movie” is really a silent film. The characters speak, but they might as well not have bothered. They mumble to themselves as if no movie were being made. Mainly, they just amble around in a film museum/library looking through files or making notes, photographed by a cameraman who does not know how to frame persons or objects. He (she?) DOES know how to focus on female necklines, filming (if that is the word) with what looks like it might have been a cellphone with a built-in video camera, complete with a light that creates a brighter circle in the middle of over half of the images. The other half appear to be available-light shots, and some are hidden by shadowy grain effects. Then we have some beach scenes filmed in a faded color process, like old 8mm images blown up. Why these scenes, with one of the three main characters playing with a whistle and looking amazed when a shadowy character shows up, are in faded color appearing within the construct of a virtually black-and-white “movie” is never explained. Are these dreams? Flashbacks? Many close-ups show the ladies being frightened — but we rarely see of what? The cacophonous sounds that pass for music often screech at us as if to tell us that something is happening, even when it is not. Some close-ups are rather sharp and clear, unlike most of the “movie,” but they seem to serve no purpose. When the young ladies sleep, they sleep with their clothes on. Even when a new girl sleeps with the male character (a boss? director? museum curator?) she remains dressed in bed even while he wears his underwear. Why? What is the relationship here between these two? Every once in a while, the screen goes black, often for no reason that I could perceive. Sometimes these are fades to black, but usually these are just cuts to a black screen. The longer black passages have sounds on the soundtrack, just as when we heard a phone ring off screen and sometimes hear a person answering. Is the creepy voice supposed to be a mothman? Oooooooo. Speaking of the alleged mothman, what are his motivations here? The mothmen are supposed to be intelligent creatures, maybe more intelligent than humans. Their motives may not be human, as Alan Bates says in THE MOTHMAN PROPHECIES, but they did do more in that film than just peer through windows like a creature in a Halloween Batman costume or crawl around on the floor of the museum scaring the ladies (never the male, it seems). Why are they here? Why this movie library? Did some viewers really find this to be frightening? These mothmen made The Babadook look terrifying by comparison. This “movie” made the film UNDER THE SKIN seem to be a fast-paced, well-editing exercise in gripping non-stop terror by comparison. Of course, this is not a professional production, and I give young filmmakers kudos for trying to be experimental. Maybe they will eventually learn the craft of editing and pacing, of presenting a story, and be able to graduate from Freshman Horror 101. In the meantime, should this experimental project be offered for sale as a real DVD film? Just asking. If this is THE MOTHMAN CURSE, who is being cursed?